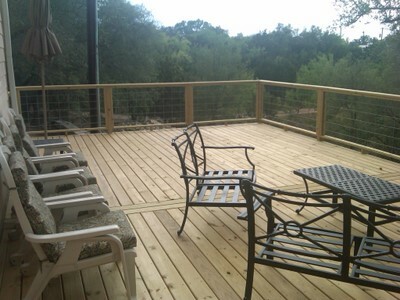 Austin Pressure-Treated Decks: The good, bad and the ugly. Pressure treated pine is a lumber product that is extensively used in framing decks and anything that is in close proximity to the ground. Years ago it was commonly called “wolmanized”, which was a brand name and today it is branded as “YellaWood“. With pressure treated pine, basically the wood is placed in a pressurized environment and a solution of micronized copper azole (MCA) is forced into the wood, leaving a very slight greenish color. When pressure treated pine is new, it is so full of fluid that it even feels wet to the touch. Over time the liquid all evaporates but the chemical still protects the wood. When I refer to the good, the bad and the ugly of pressure treated wood, I am referring to the advantages as well as the drawbacks to using pressure treated pine. The good aspect is that it is the least expensive deck material available. It has a strong weather resistance. It is guaranteed not to rot or decay and is offers a high resistance to wood eating insects. The bad aspect it that it requires higher maintenance. Choosing pressure treated will require sealing or staining at the very minimum every year. It is also less attractive than cedar or other softwoods. It is also more prone to knots than other softwoods as well. Now for the ugly part. The same virtues that make pressure treated resistant to rot, decay and wood eating insects, creates other problems like shrinkage, splitting, cupping, and makes the wood more prone to checking. The warranty will only cover rot, decay, insects and structural integrity on pressure treated pine. The warranty does NOT include shrinkage or other issues. 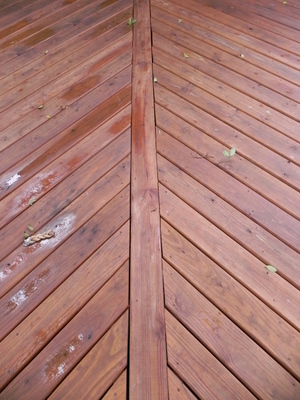 The great thing about pressure treated material is that if you’re trying to hold to a tight budget, you can get more deck for your money by using pressure treated, but you have to be prepared to spend the time and money it will take to maintain the pressure treated. You will also have to cope with the heavy saturation of fluid that is present in the material itself. On the first application it is good to wait a month before staining to give the water time to evaporate from the wood. To better understand the terminology that is used when referring to pressure treated wood I have compiled a list of the commonly used terms and their meanings. Seasoned builders use these terms as second nature. Any homeowner considering a deck or other outdoor structure built using pressure treated wood should become familiar with these terms and their meanings. Shrinkage is the decrease in the dimensions of the wood itself by the loss of moisture content. Checking means a lengthwise separation in the wood which is caused by stresses the wood is put under while it is seasoned. Splitting is when the wood splits, this can happen in large or small sections of the wood. Cupping means the board is distorted away from the straight line that runs the width of the board. Twisting occurs when one corner of a piece of wood twists out of the plane of the boards around it. MCA is the chemical used as the preservative in pressure treated woods. MCA stands for micronized copper azole. Rot and decay entails the breakdown of the woods structural properties usually by outside forces such as water, moisture and in some scenarios condensation, humidity and lack of proper air flow. Wood Insects are insects that eat wood . There are a side variety of insects that feed off wood the most well-known being the termite. Wood Knots are located at the hard mass of wood where the branch joins the trunk of the tree. They are quite desirable for aesthetic appeal and are coveted in custom furniture making, but knots can lead to warping and cracking in some cases. As is the case with any material that you decide upon to build your outdoor structure, knowing the pros and cons before you break ground is of the essence. Pressure treated woods are great for the budget minded but the value you receive is consistent with your desires and budget. This entry was posted on August 5, 2011 by austinporchandpatio. It was filed under Decks, Pressure treated decks and was tagged with Archadeck of Austin, Austin wood vs composite deck, Pressure-treated decks Austin, PT deck builder Austin, Wood decks Austin.